Costume Design: Just Satin, Stitches & Sequins? Could you design a costume for Costume Gallery’s 2016 catalog? I’ve always been fairly creative and I’ve danced and choreographed for as long as I remember, so I’d like to think that I’m artistically inclined. But can I lend my hand to fashion design, or more specifically, costume design, for one of the world’s leading dance costume design houses? Costume Gallery CEO Linda Bradbury threw down that challenge, inviting me to the CG Headquarters to design a costume with their talented team for the 2016 catalog. It had me shaking in my socks, in both excitement and nerves! Dance Informa’s Editor Deborah Searle looking through fabric samples at Costume Gallery, NJ. I love dance costumes. What dancer doesn’t? From the excitement of seeing what you’ll wear each recital season as a child to the costumes that bring to life the vision of your choreographer as a professional dancer, costumes hold a special place in our hearts. I have never forgotten my first ballet costume – I was a poodle complete with a white and silver fluffy tail that I proudly wiggled! I’ve worn a huge variety of costumes over the years from poodle suits to poodle skirts for a production of Grease. But could I actually design one that dancers and teachers would like and that was both elegant and practical for the demands of dance? On a rainy afternoon in New Jersey, I arrived at Costume Gallery to be quickly blown away by the color and texture of millions of yards of every fabric you could ever think of, as well as the passionate and talented staff. I was given the opportunity to work with Design Director Kimberly Keller and Senior Designer Heather Chamberlain, who were both so gracious to put up with my giddy, excited prancing about the design studio. I was proudly shown around the impressive facility and in my element in the rooms of fabric swatches, as I was told I could pick whatever fabrics caught my eye! I spoke with Kim and Heather about their design inspirations, which included everything from fashion and bridal magazines, to nature, music and pieces of fabric they collect from overseas expeditions. The walls of the design studio are covered in stunning pictures, magazine cutouts, drawings, flowers, appliques, and basically anything that sparkles and everything that’s fabulous. Heather and Kim let me play through racks and racks of costumes and past catalogs and see the progression of their personal designs from first sketch to finished product. I was like a kid in a candy shop! I’ve never seen so many beautiful costumes, so much tulle and so many sequins. It is a costume lover’s paradise! I am a planner, so I couldn’t turn up without several ideas and even a Pinterest wall of pictures that inspired my costume design. 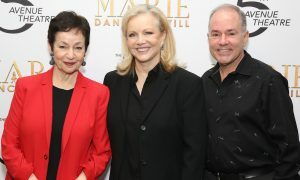 After reading in Dance Informa about Susan Stroman’s new musical, Little Dancer, based on impressionist artist Edgar Degas’ ‘Little Dancer Aged Fourteen’ sculpture, an idea ignited to create a Degas-inspired costume that could cross over into both ballet and contemporary. Senior Designer Heather Chamberlain creating the first sketches. I watched video footage of the stunning Tiler Peck jeté in her costume as Little Dancer for Stroman’s work and looked through a book of Degas’ famous ballet paintings and drawings. I foraged through the internet looking at pictures of Degas’ ballerinas and wondered about the possibilities of bringing the look into 2015; paying homage to the costumes of his paintings while bringing them into the future and making them versatile enough for today’s melding of traditional and contemporary ballet and even lyrical jazz. I was elated when Kim and Heather were excited about my idea, and Heather quickly started sketching a design on paper as I vocalized what was bubbling in my brain. The costume started to take shape! We went back and forth on how best to create the right look and to make sure the costume would be popular with both dancers and teachers. What lines are more flattering for the figure, what length or shape will give more movement, and what cut will give more modesty? And then it was on to picking the materials. What materials will give the desired soft, ethereal look and what materials work best together? I didn’t realize that so much went into each and every design of the 400 or so costumes that Costume Gallery has each year in their full and varied range. I was looking to create a romantic, antique look and to use colors from Degas’ famous paintings. It was a challenge to pick two color palettes that would give the desired aged look while still having enough color and boldness to pop on stage. We decided to use a dusty gold tulle with a light sprinkle of glitter, overlaid with either blush pink or teal tulle for the layered skirt. For the piped bodice, we chose either a blush pink or teal lycra top with beautiful lightly-sequenced lace in the middle panels. The sleeves and low scoped back with sash and bow are reminiscent of Degas’ dancers of the late 1800s, but the cut and flair of the skirt is a modern, more edgy take on a romantic long tutu. The final design and colors. After sketching away and playing with many fabric swatches, the final design, colors and materials were chosen. Wow, I had actually created a costume! And a beautiful one at that! I was feeling very chuffed, but I’m very conscious of the fact that it was Kim and Heather’s experience and keen design eyes that really made the magic happen. They are geniuses, and so passionate about what they do. So what’s next? My design was given to the pattern maker who has been busy creating the sewing pattern. The material has been ordered and a mockup will be created for me to view. Then we will see what it really looks like and if it will actually be a feasible stage-worthy creation. Factors like final cost of product, based on the difficulty of the sewing required and amounts and costs of materials requested, will all be assessed and we may need to tweak the design several times before final sign-off. 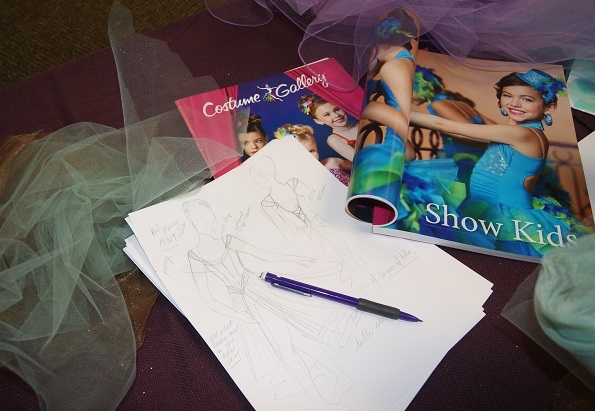 Then the costume will be sewn and brought to life by a young dancer in early 2015 for the Costume Gallery catalog photo shoot. I can’t wait to see my costume evolve! 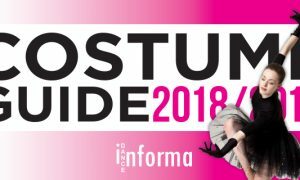 Follow my costume journey on Instagram @DanceInforma and Facebook/danceinforma and look out for my next update as I travel to NJ to see my costume in the flesh! 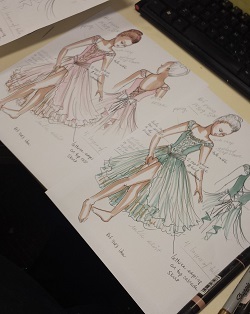 Photo (top): The first sketches of the costume design. Alexandra Costumes makes its big entrance! Dance Classes for 3 Month Olds?